Spectrum (Lat., an image), the name given to the image or colored band formed by the decomposition of a beam of light into its elementary colors. Thus, when a beam of sunlight enters a dark room through a narrow slit, passes through a triangular glass prism, and then falls upon a screen, Ave may observe that the beam of light has been spread out by the prism into a wedge-shaped beam of various colors, which falling on the screen forms a spectrum. This spectrum of the sun's light may be divided into seven colors, red, orange, yellow, green, blue, indigo, and violet, named in the order of their increasing angular deflection from the direction of the beam of light before it encountered the prism. If the light from the flame of a lamp burning alcohol which contains common salt should enter the slit in place of the sun's light, the spectrum formed on the screen will be found on minute examination to consist only of two closely approximate yellow bands, the remainder of the spectrum which had been obtained with the sun's light being entirely absent. With the light from a flame tinged with the vapor of lithium we obtain a spectrum formed only of two bands, one in the red, the other in the orange. It has thus been found that spectra differ widely, according to the nature of the incandescent substances from which they emanate. Some, as in the case of incandescent solids, like platinum, are continuous and formed of all of the seven colors; others, as in the cases of the spectra of sodium, lithium, and potassium, are formed of colored bands separated from each other by spaces devoid of all light; while again other spectra, like those of the sun and of the fixed stars, are continuous, like those of incandescent solids, but crossed transversely by a multitude of very narrow spaces devoid of light, or nearly so. (See Spectrum Analysis.) In the present article we shall consider the spectrum of the sun, and will give in order 'an account of the manner of its production, of the methods of measuring the lengths of the waves of the various rays composing it, and of the actions of light, heat, chemical decomposition, and fluorescence produced by the different spectral rays when they impinge upon bodies peculiarly constituted to develop and make manifest the above named actions. - Spectra are usually obtained either by the dispersive action of a prism, or by the diffraction of a "grating " formed by cutting with a diamond point on glass or on speculum metal several thousand equidistant and parallel straight lines in the space of an inch. The prismatic spectrum is formed with purity when the sun's light enters a fine slit formed between parallel edges about 1/50 of an inch apart, and, after progressing into a dark room for 15 or 20 ft., passes through a prism of clear homogeneous glass and then traverses an achromatic lens of about 6 ft. focus. This lens is placed so far from a screen that it forms on it the image of the slit through which the sunlight enters the room, when the prism is replaced by a plane mirror which reflects the rays on to the screen. The prism in the above experiment must be placed at "the angle of minimum deviation;" that is, it must be so adjusted that the incident beam receives the minimum deviation from the refractive action of the prism. Fraunho-fer substituted a telescope for the lens and screen, and viewed the spectrum formed at the focus of its object glass, as shown in fig. 1. This instrument is called a spectroscope. A spectrum, formed as just described, is crossed transversely by dark lines of various breadths and degrees of blackness. These lines are unevenly distributed throughout the length of the spectrum; but the same line always occupies the same position when referred to the tint in which it exists. Fig. 2 gives the spectral lines as mapped by Fraunho-fer in vol. iv. of the "Memoirs" of the academy of Munich for 1814-'15. To distinguish these lines Fraunhofer designated them by the letters of the alphabet, in proceeding from the red to the violet end of the spectrum. Thus A exists in the extreme red, while H is in the violet near the boundary of the visible spectrum. Fraunhofer mapped in the spectrum 576 lines, and ever since the publication of his drawing these lines, and also the invisible lines subsequently discovered beyond the violet and red ends of the spectrum, have been called "the Fraun-hofer lines." Subsequent observers modified Fraunhofer's instrument by substituting for the distant slit a collimating telescope (A, fig. 3); this consists of an achromatic lens with the slit at its principal focus. Kirchhoff with the spectroscope shown in fig. 3 has made an exquisite map of the spectrum, containing more than 3,000 lines. - The relative positions of the lines in the spectra obtained from prisms formed of different refracting materials, or even from the same material at different temperatures, differ so much that maps made by different observers are not comparable; hence recourse has been had to spectra formed by transmitting light through gratings. From measurements on these spectra, known as diffraction or interference spectra, can be deduced the lengths of the waves of light corresponding to any tint in the spectrum. The wave lengths are really given corresponding to the fixed lines in the spectrum; and as these lines hold fixed positions in reference to the colors in which they exist, we have unchangeable wave lengths to which to refer any color that may be used in such practical purposes as the determination of indices of refraction or in observations in spectrum analysis. If we look at a distant slit with a telescope before which we have placed a grating, we see a white central image of the slit, just as if the grating were not in front of the telescope; but we observe besides this central white line a series of spectra to its right and to its left. These spectra have their violet ends placed toward the central image of the slit, and they are named in the order of their removal from the slit; as spectrum of the first order on the right or left, spectra of the second, third, fourth, etc, order on the right or left. These spectra are often of great purity, so that hundreds of Fraunhofer lines can be seen with remarkable clearness. If the telescope, T E, be mounted on a divided circle, D, and the grating, G, placed in front of a collimating telescope, C, furnished with the slit at S, as in fig. 4, we can measure in the different spectra the angular distances of these lines from the centre of the image of the slit, and the angular distances from the centre of the image of the slit to the same line in spectra of different orders will be nearly as the number of the orders. Thus, if we call a this angle in the spectrum of the first order, it will be 2a, 3a, 4a, etc, in the spectra of the succeeding orders. It necessarily follows from this fact that the length of the spectrum in any order will be as the number of the order; thus, the spectrum of the third order will be three times as long as that of the first order. It has also been found that the length of the spectrum of any order will be inversely as the distance separating the lines of the grating producing the spectra; thus, the spectrum of the second order produced by a grating of 5,000 lines in an inch will be half as long as that of the second order given by a grating having 10,-000 lines in an inch. Let parallel rays of light from a distant point or from the slit of a collimating telescope fall perpendicularly on the plane of the grating G G, fig. 5. The plane of the wave front of the light will be parallel to the plane of the grating, and the vibrations of the ether at each point in the openings of the grating will have the same phase. But whenever light falls upon such constructed apertures as those of the grating, the points in these apertures, situated in the plane of the grating, become centres of origin of vibrations, and the rays which have passed through the apertures diverge in planes at right angles to the lines of the grating. The consideration of the mutual action of these rays will lead at once to remarkable results. 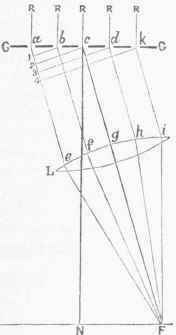 All those rays which have traversed the grating in the same direction as that in which they struck it will have the same phase of vibration, and therefore when brought together in the focus of a lens will form there a white image of the distant point or of the slit of the collimating telescope. But it is not so with the parallel rays, which diverge laterally, say in the direction ae, bf, cg, dh, etc. If these rays be brought to a focus by means of a lens L, we shall observe at F not a white image of the slit, but a colored one; and it is found that this color will depend on the inclination of the diffracted rays to R N, the perpendicular to the plane of the grating. Suppose that the diffracted rays ae, bf, cg, etc, are so inclined to the plane of the grating that a perpendicular, 51, let fall from the centre of one opening in the grating to the parallel ray a e emanating from the centre of the contiguous opening, cuts off .on the ray a e a distance al, equal to the length of a wave of violet light of a definite tint. Also imagine other perpendiculars e2, d3, etc, let fall in like manner upon the ray a e. Then if all of these rays ae, bf, eg, dh, etc, be brought to a focus at F, the vibrations of the ether at this point will all have the same phase, and hence will give at F a line which will be formed of violet light; and the intensity of this light will be equal to the sum of the intensities of all the rays ae, bf, cg, etc. The same reasoning-will hold good for any other set of rays parallel to those just described, and all symmetrically placed in the openings. Hence all rays emanating from the openings and parallel to the rays a e, bf, c g, etc, and having wave lengths equal to al, will conspire in their vibratory actions when brought to a focus at F. But it is not so with other rays, which, although parallal to the rays a e, bf, etc, have not the same length of waves as al; for they will not conspire when brought together at F, but will interfere, or in other words will be exactly opposed to each other in vibratory action, and hence will disappear as light when brought to the focus at F. For example, suppose we consider a series of rays of red light which proceed parallel to a e, bf, etc, and come to focus at F. These rays are formed of waves which are about twice as long as those of violet light, or in other words as al; hence red rays which have emanated from symmetrically placed points in two contiguous openings of the grating and proceed in direction parallel to a e, will, on coming to the focus F, all differ by half of an undulation, and hence red light cannot exist at F with an inclination of diffracted ray equal to N c F, but can only exist at a point at such an angular distance from R N that the perpendiculars let fall from a, b, c, and d on to a e cut off on this latter line distances respectively equal to double the lengths al, a2, a3, a4. Again, suppose that the wave lengths of two rays, emanating from symmetrically placed points in two contiguous openings and proceeding parallel to a e, differ by only 1/1000 of the wave length of one of these rays, then these rays will also interfere when brought to focus at F; because the phases of the rays emanating from points symmetrically placed in the 1st and 2d openings of the grating will differ by 1/1000 of an undulation; those from the 1st and 501st openings will differ by 500/1000 or half a wave length, and therefore will interfere. The same interference will take place between the rays from the 2d opening and those from the 502d, and those from the 4th and the 504th openings, and so on. Hence rays of light having any other wave length than al will almost completely disappear as light by their interference, and the light collected at F will be that which is produced by ethereal vibrations of wave lengths equal to al. The same reasoning holds good for any bundle of parallel rays having diffracted angles different from N c F, and hence we have a pure spectrum formed at the focus F. It thus appears that there is a connection between the angle NcF of the diffracted rays, the length al, and the color observed at F. The color at F varies with the angle. N c F, or, what is the same, with the length al. For the extreme red rays the angle N c F is at its maximum, and al is equal in length to about .00077 mm. ; for the extreme violet rays the angle N c F is at its minimum, and a1 is equal to about .00039 mm. ; therefore the violet ends of the spectra will always be toward the image of the slit. The determination of a wave length consists in the measurement of the length a1. To measure this length, we first determine the distance between the centres of two contiguous openings in the grating, and then the angle NcF corresponding to any given tint or fixed line in the spectrum; and as the angle a b1 is equal to the angle N c F, a1 is equal to a b multiplied by the sine of NcF. Let s stand for a b, d for the angle N c F, and l for a1, or the wave length; then l = s x sin. d. If the ray a e, and symmetrically placed rays, be inclined to the plane of the grating so that the perpendicular b1 cuts off on a e a distance a1 equal to two wave lengths, we shall have the same actions over again, only the spectra produced by them will be more deflected to the side of the image of the slit; and thus are produced the spectra of the 2d, 3d, 4th, etc, orders. The length of any one of these spectra will necessarily bo nearly as the number of the order of the spectrum. The wave length of the same tint, or of the same fixed line, can be determined from angular measures made on this tint or line, in the spectra of all orders. From such measures we obtain multiples of the wave length, and the formula for measures on the nth order of spectrum becomes l=s Xsin.d / n.
In the actual measures which have been made, to form what is called a map of "the normal solar spectrum," the plane of the grating is placed in the axis of a divided circle, and is generally adjusted so that this plane is at right angles to the line of collimation of the collimating telescope carrying the slit. 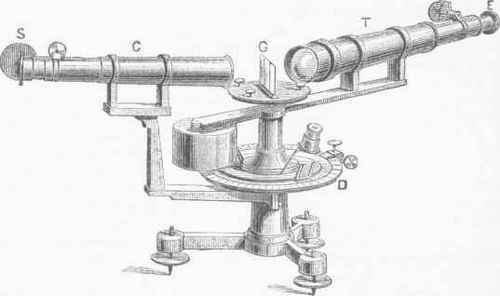 The observing telescope is placed on the other side of the grating, and has attached to it verniers, or reading microscopes, which it carries over the divided circle as it rotates around its axis, as is shown in fig. 4. Fig. 1. - Fraunhofer'a Spectroscope. Fig. 2. - Fraunhofer's Solar Spectrum. Fig. 3. - Kirclihoffs Spectroscope, by Steinhcil. Measures of the wave lengths of the rays forming the solar spectrum have been made by Fraunhofer (Denkschriften der munchener Akademie, vol. viii. ; Gilbert's Annalen, vol. lxxiv. ), Ditscheiner (Berichte der wiener Akademie, vols. 1. and lii. ), Van der Willigen (Me-moires d'optique physique, Haarlem, 1868), Mascart (Comptes rendus, lviii., p. Ill; Annales scientifiques de Vecole normale superieure, vol. iv. ), Angstrom (Becherches sur le spectre solaire, Berlin, 1869), Eisenlohr (Poggendorff's Annalen, vol. xcviii. ), and Stefan (Berichte der wiener Akademie, liii.). Mascart made an important modification in the process, as above described. In his measures he placed the plane of the grating at such angles to the axis of the collimator that the observed line was seen with its minimum angle of deviation, and thereby obtained greater simplicity of adjustment with superior accuracy in his measures. In his method the formula becomes l=2s/n x sin.d/2. He came to the conclusion that the upper or more refrangible of the two D lines of Fraunhofer has a wave length of .0005888 of a millimetre. This result agrees with the determination made by Fraunhofer, and physicists now generally adopt this determination as exact. The considerable differences observed in the determinations of the wave length of the same ray by different observers are not alone owing to the variations always existing in honest measures of precision, but chiefly to the difficulty of obtaining regularly ruled gratings, and to the resulting uncertainty in the knowledge of the distance separating the centres of two contiguous openings in the grating. All physicists have until recently obtained their gratings from Nobert. Lewis M. Rutherfurd of New York has for several years past given much labor to the production of perfect gratings, and an engine (fig. 6) which he has recently made produces gratings more uniformly ruled than any known to us. On a hollow cast-iron block are cut, at right angles to each other, two V-shaped guides. On one of these guides slides the iron plate D, moved by means of a screw acting in a nut attached to its under surface. On this plate is fastened the plane of glass or speculum metal which is to be ruled. On the other guide slides the plate L J, having a reciprocating motion given to it by a lever, the action of which will be described further on. To this plate is attached the tool holder carrying the diamond-pointed cutter. The motive power of the machine is a small turbine from which passes a cord around the driving wheel. On this driving wheel is a pin to which is jointed the connecting rod A F. This connecting rod is hollow, and in it moves a rod which is constantly pressed toward the pin on the driving wheel by the spring shown at A. When the rod A F moves upward, the arm F I oscillates on its rocking shaft (the end of which is seen in the figure, projecting horizontally), until the end I of this arm comes against the fixed pin placed under it, and in contact with which it is shown in the drawing. 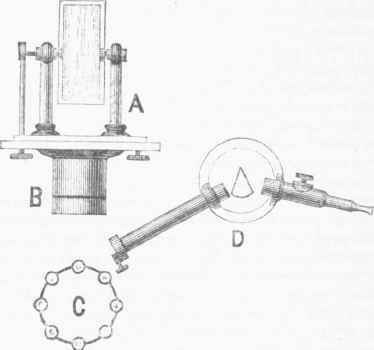 Just before this upward movement of the rod A F begins, the pawl H falls into a notch on the wheel B, which is attached to the screw of the engine, and during the upward motion of the rod A F the pawl II presses against the notched wheel and rotates it a definite fraction of an entire revolution. The pawl H having completed its "throw,"' the crank pin on the driving wheel passes its upper centre, and then the slotted lever G lifts the pawl out of the teeth of the wheel B, so that no jarrings or tremors are given to the-machine while the pawl is retreating to take a fresh hold on the feed wheel B. A pin attached to the connecting rod passes through a slot in the tube A F, and serves to hold the two together when the rod is making its downward motion. The amount of rotation to be given to the feed wheel B is regulated by rotating to the right or to the left the collar on the rock shaft, to which the pawl II is jointed. Directing attention to the plate L J, to which is attached the cradle N carrying the diamond-pointed rod M, we observe at K the right-hand end of a rod the extremities of which pass through holes in the iron frame of the engine. This rod is moved parallel to the V guide of the plate L J by means of an oscillating lever which works in a vertical slot attached to the rod K, and is fixed on the same rock shaft which carries the lever F I. Projecting upward from the rod K is a short rod whose end is shown at L. This rod moves in a short slot cut in the direction of the length of the plate L J, as shown in the figure. The action of the cutting point of the tool M can now be explained. While the pawl H is rotating the feed wheel B, the rod L presses against the left-hand end of its slot and moves the slide J from right to left. The plate J cannot move, as above indicated, until the rod L touches the left-hand end of its slot; and when it reaches this position the left-hand end of the rod K has moved to the left sufficiently to press against the lower point of the cradle N, and hold the diamond-pointed tool M elevated above the plate of glass or speculum metal during the entire left-hand motion of the plate J. When the end F of the lever F I descends, the rod K moves from left to right, and the projecting pin has to move up to the right-hand end of its slot before it can push the plate J to the right. During this motion of L in its slot, the left end of the rod K has allowed the diamond point on M to rest on the glass plate, so that before the plate J begins its right-hand motion the diamond point is at rest on the plate to be ruled. The plate J now moves to the right, and the diamond point cuts a line. But the diamond point is lifted, before the right-hand motion of the plate J ceases, by the side arm O of the cradle N-coming against the inclined surface of the side piece P. The diamond is thus raised, and is held in this position by the depression of O against P until the left-hand end of K has moved up to the cradle and holds the tool elevated during the motion of the plate J to the left. After this motion has ceased, the diamond is lowered to the glass plate, and another cut is made; and so on, the machine working automatically until the plate is ruled. The pitch of the screw is 1/48 of an inch; hence, by knowing the fraction of the revolution of the screw made between two contiguous cuts, we know the distance, in fraction of 1/48 of an inch, separating the centres of two contiguous lines on the grating. The diameter of the feed wheel B is 6 in., and from this dimension the reader may estimate the size of the other parts of the engine. The excellence of the work done by this engine depends on certain peculiarities of construction : 1. The errors in the throw of the screw, caused by its eccentricity, or want of coincidence of the axis of figure of the screw and its axis of motion, are corrected by giving to the feed wheel B an eccentricity opposed to that existing in the screw. The screws at 0, C, C, 0 serve to alter the position of the centre of the feed wheel B, and thus to obtain the required eccentricity. This balance of opposing eccentricities is obtained by a delicate and precise method devised by Mr. Rutherfurd. A grating ruled by the engine on speculum metal or silvered glass is examined at such an angle of reflection that the light reflected from the plate appears of one color; for example, red. If we could cause the lines on this grating gradually to approach each other and narrow the spaces separating them, we should observe the red tint becoming gradually lighter in hue, and then gradually changing into orange, yellow, green, etc. Hence uniformity of tint is an indication of uniformity of ruling; therefore, if we tilt a grating placed in front of a flame and examine it by means of a lens and find it of a uniform color, we are sure that the screw is doing accurate work; but if the screw have a periodic error like eccentricity, then we shall observe a columnar appearance on the plate, owing to periodic variations in depth of color. By a careful comparison of the positions of these colors with the known positions of the screw when the corresponding portions of the grating were cut, we ascertain the direction in which to move the centre of the feed wheel B in order to correct the eccentricity of the screw. 2. The nut in which the screw of this engine works is 3 in. long, the threaded portion of the screw being 3½ in. long. This long nut tends to preserve the accuracy of the engine's work. 3. The original method devised by Mr. Rutherfurd to obtain rectilinear V guides is a new and important feature of this engine. A collimating telescope with a vertical slit, or cross threads, at the focus of its object glass, is placed in a firm position in a line with the guide to be tested. On the slide which moves on the V guide is fastened a telescope with cross threads at the focus. 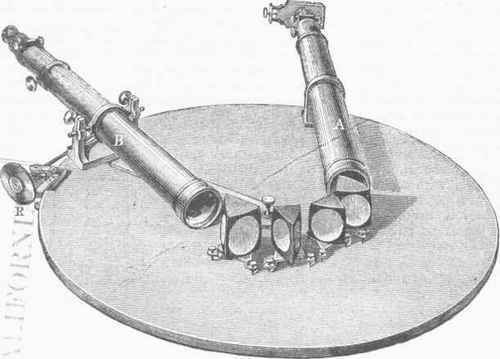 The slit of the collimating telescope is viewed in the other telescope as the slide carrying the latter is moved to and from the collimator. If the slit is constantly bisected during this motion, the guide is accurate; but if the image of the slit moves when referred to the cross threads, then the guide has to be corrected until by trial the image of the slit remains stationary during the telescope's motion. 4. The pawl H during its retraction does not fall over the teeth of the feed wheel, and by jarring the machine cause the diamond to cut an irregular or waving line. 5. The method of lifting the diamond point while it is obtaining its position for a new cut is the simplest we know of. 6. The screw of this engine, on which the results mainly depend, is constructed as follows: A screw is first cut in a lathe with a single pointed tool, then scored; it is then hardened, and thus a tap is obtained. This tap is now centred by its threads, and cylinders are ground on its ends so that they are concentric with the threads of the screw. Blocks of metal are now firmly screwed on to the bed plate of a planer, and Vs are cut in these blocks to support the cylindrical ends of the screw tap. A stock holding blank dies is placed in the tool holder of the planer, and these dies are screwed against the screw tap. The stock is then firmly screwed to the tool holder. The threads of the dies are now cut by rotating the screw tap two or three times through the dies; then, relieving the die stock in the tool holder, the dies are again tightened on the screw tap; the stock is now screwed tightly on the tool holder, and the screw tap is again traversed through the dies. This operation is repeated until the dies are finished, when they are hardened. A screw which is to serve for the ruling engine is now cut on the lathe with the same single-pointed tool which cut the thread of the master tap. This screw is nearly finished on the lathe. It is then placed in the same Vs which previously held the master tap, and the dies, just described, are placed in the tool holder of the planer, and with them the thread of the screw is finished. The screw is now rotated on its threads in a long cast-iron V, and shoulders are turned down on the ends of the shaft of the screw. The nut for this screw is cut with a single-pointed tool. The screw is now run into its nut, and they are ground together with finely powdered pumice stone. The screw of this engine has only one collar, on which it turns near the feed wheel B. The other support of the screw is the long nut. Without this arrangement Mr. Rutherfurd found it impossible to cut regular gratings. - Actions of the Spectral Bays. A large mass of evidence shows that all of the known emanations from the sun consist of rapid vibrations caused by that luminary in a highly elastic medium, known as ether. We must suppose that this ether fills all known space, for we can only be cognizant of celestial bodies from their vibratory actions on the ether through which they constantly move. The nature of the manifestations of these ethereal vibrations will depend on the nature of the bodies on which they fall. Thus, what in its essential nature is a mere vibratory motion, we may interpret as light if these vibrations fall on the retina, or as heat if they fall on our skin, or as chemical action if they fall upon a photographer's plate. This preliminary conception established, we can readily interpret the various actions of the spectrum on different bodies, if we also take into consideration the manner in which the spectrum is formed, that is, whether by the diffractive action of a grating, or by the dispersive action of a prism. We should also take into account the nature of the body forming the grating or the prism. The upper portion of fig. 7 shows a prismatic spectrum crossed by the principal Fraunhofer lines, from A to the line O. A photometric examination of this spectrum shows that the distribution of light in it is represented by the curve B, whose heights above points on the base line are in the ratio of the intensities of the light at corresponding points in the spectrum. The maximum of light is found to exist in the yellow at a point distant from the upper D line one third of the distance of this line from the line E. A thermometric examination of this spectrum will give a distribution of heat throughout its length represented by the curve A, and the maximum of heat is shown at a point beyond the extreme red, at a distance equal to that of the line A from the line C. The curve C gives the distribution of chemical action in this spectrum, as found when it falls upon a surface of bromide of silver. The maximum of action is about midway between G and H. It is important to remark that the curves here given only apply to a spectrum which has been formed by this particular kind of glass and has been received on the surfaces indicated. Thus a prism of different glass would change the place of the maximum heat, and the substitution of another chemical surface on which the spectrum falls will cause a shifting of the place of maximum chemical action and a contraction or expansion of the area chemically affected. - Heat Actions of the Spectrum. Sir William Herschel in 1800 first discovered that the heat in the spectrum increased from the violet to the red, and reached its maximum intensity at a distance beyond the red "in the invisible rays of the spectrum." He projected the results of his experiments in a curve which bears a close resemblance to the one given in fig. 7. He experimented on these "invisible rays," which he was the first to discover, and showed that they were reflected and refracted according to the same laws that rule in the reflection and refraction of light. He says that "if we may infer the quantity of the efficient from the effect produced, the invisible rays of the sun probably far exceed the visible ones in number. "He then condensed these rays by means of concave reflectors and lenses, and made a "trial to render the invisible rays of the sun visible by condensation." He showed "that by condensation their heating power is proportionally increased; for, under the circumstances of the experiment, we find that it extended so far as to be able to raise the thermometer in two minutes no less than 24°." In the same series of researches ("Philosophical Transactions," 1800) he says: "If we call light those rays which illuminate objects, and radiant heat those which heat bodies, it may be inquired whether light be essentially different from radiant heat. In answer to which I would suggest, that we are not allowed by the rules of philosophizing to admit of two different causes to explain certain effects, if they may be accounted for by one. ... It remains for us only to admit that such of the rays of the sun as have the refrangibility of those which are contained in the prismatic spectrum, by the construction of the organs of sight, are admitted, under the appearance of light and colors; and the rest, being stopped in the coats and humors of the eye, act on them, as they are known to do on all the other parts of our body, by occasioning a sensation of heat." In 1865 Tyndall repeated the researches which had previously been clearly marked out by Herschel. 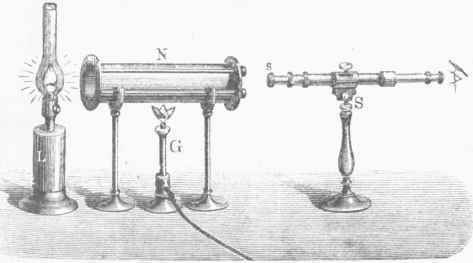 In his first series of experiments he employed the electric lamp as the source of light and heat, and used a linear thermo-battery (see Heat) as a thermometer. He used prisms of rock salt instead of glass, and in certain of his experiments he passed the beam from the electric lamp through a tank containing a solution of iodine in carbon disulphide. This solution has the property of absorbing all of the radiations producing light, and allowing the invisible rays of heat alone to traverse it. Herschel had already found that the "invisible rays of the sun far exceed the visible in number." Tyndall by similar experiments found that "the thermal energy of the invisible radiation of a very powerful electric light is eight times that of the visible." Tyndall, with the more efficient means at his command, repeated Herschel's experiments on the condensation of the invisible rays, and caused them to ignite to whiteness solids like platinum. This property of these condensed rays he called " calorescence." Seebeck (Memoires de Vacademie, Berlin, 1819) first showed that the position of maximum heat in the spectrum changes with the nature of the prism, and sometimes occurs in the red. Mel-loni (Journal de l'institut, vol. i., p. 212) proved that the effects observed by Seebeck were owing to the absorptive action of the materials of the prisms, and with prisms filled with water and alcohol he observed the maximum temperature in the yellow. In a spectrum which Mel-loni obtained by passing the sun's rays through a prism of rock salt (the most diathermanous of all substances), he found the maximum of heat beyond the red rays at a distance from the line B nearly equal to the distance of this same line B from the line F. Melloni used the thermo-battery of Nobili for a thermometer. Sir John Herschel ("Philosophical Magazine," April, 1840) examined the distribution of heat in a spectrum by using paper covered on one side with lampblack and then moistened with ether or alcohol. On allowing the spectrum to fall on the uncoated side of the paper, he observed the rate of evaporation of the ether, and thus saw the superior heating effect of the rays beyond the red; and by this method he also detected the existence in the invisible spectrum of ather-mic bands, which corresponded to the Fraun-hofer lines seen in the visible spectrum. In 1843 Dr. J. W. Draper of New York obtained photographs of these bands by projecting a spectrum on a daguerreotype plate, while the latter was at the same time exposed to a diffused light of feeble intensity. In 1847 Fizeau and Foucault, by means of minute mercurial thermometers, detected in the spectrum of a flint glass prism a large athermic band beyond the red, at a distance from the line A equal to the distance of this line from D. In 1871 Lamansky, with a linear thermo-battery ("Philosophical Magazine "), confirmed the observations of Herschel. The most recent research on the distribution of heat in the spectrum is by Dr. J. W. Draper ("American Journal of Science," 1872). He maintains that the observed increase of heat in the spectrum, as we proceed to its red end and advance beyond this point, is owing to the fact that any prism by its unequal refractive action on the spectral rays must give a spectrum which is abnormally condensed at its red end and dilated at its violet. He calls attention to the fact that the middle of the normal or diffraction spectrum is at the point where falls the ray whose wave length is '0005768 of a millimetre. This is a point a little above the line D. The distribution of the rays in the prismatic spectrum of a flint glass prism compared with the normal spectrum is shown in fig. 8, where the two spectra have the same length, and their optical centres, as given by wave length, are in the same line. From a long series of experiments on the spectra obtained by prisms of flint glass, rock salt, carbon disulphide, and quartz, Dr. Draper infers that the amount of heat contained in the visible normal spectrum from its optical centre to the line H2 is equal to the heat contained in the same spectrum from its optical centre to the line A. " Assuming this as true," he says, " it necessarily follows that in the spectrum any two series of undulations will have the same heating power, no matter what their wave lengths may be." It appears that this conclusion is too extended a deduction from such a restricted result as Draper reached; for if the variations of heat in the spectrum were symmetrically divided by a line drawn through its optical centre, the same result would be attained by Draper's method of experimenting. In other words, if the maximum or minimum of heat existed at the optical centre, and the heat declined uniformly above and below this point, or if a series of maxima and minima were symmetrically distributed above and below the optical centre, then each half of the spectrum, divided at its optical centre, would give the same heating power. Recently E. Lundquist (Poggendorff's Anna-len, vol. clv.) has shown how Cauchy's formula, which serves to connect the index of refraction of a ray with its wave length, may lead to an expression which serves to reduce the distribution of heat observed in a prismatic spectrum to what it would be in a normal spectrum. He finds that the observations of Lamansky, made with flint glass and rock salt prisms, when thus reduced place the maximum of heat about the middle of the normal spectrum, and the heat diminishes uniformly on both sides of this point. In the spectrum of the electric light, however, the maximum of heat is near the line A; hence in this case the optical centre of the spectrum does not divide it into two portions having equal heat-giving powers. - Chemical Actions of the Spectrum. Conclusions as to the distribution of chemical action in the spectrum have generally been reached solely from the observed actions on compounds of silver; and what is often styled " the curve of chemical force " in the spectrum we have given in fig. 7. This curve is generally referred to as giving the distribution of chemical action in all cases. 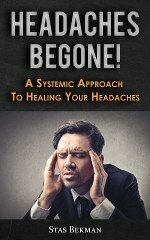 This is erroneous; as long ago as 1842 Dr. J. W. Draper showed: 1, that so far from chemical influences being restricted to the more refrangible rays, every part of the spectrum, visible and invisible, can give rise to chemical changes, or modify the molecular arrangement of bodies; 2, that the ray effective in producing chemical or molecular changes in any special substance is determined by the absorptive property of that substance. He found that if a spectrum be received on iodide of silver formed on the silver plate of the daguerreotype, and the impression of the light be then developed, after it has acted for a moderate time we shall observe a stain which corresponds in character and position to the blackening effect that under like circumstances would be found on any common sensitive silver paper. If, however, the action of the light be long continued, a white stain makes its appearance over all the less refrangible regions of the spectrum. But if the daguerreotype plate (luring its exposure to the spectrum be also receiving diffused light of little intensity, it will be found on developing that the impression obtained differs strikingly from the preceding. Every ray that the prism can transmit, from below the extreme red to beyond the extreme violet, has been active. The ultra red athermic lines are present. The impression of these lines is a proof of proper spectrum action, and distinguishes it from that of diffused light, arising either from the atmosphere or from the imperfect transparency of the prism. In a series of photographic prints accompanying a paper by Dr. Schultz Sel-lak "On the Sensitiveness to Light of Haloid Salts of Silver, and on the Connection between Optical and Chemical Absorption," may be observed the varying extent of the chemical action of the spectrum and the shifting of the place of maximum action depending on the nature of the chemical preparation on which the spectrum is formed. Thus, chloride of silver collodion is acted on by the portion of the spectrum from about half way between the lines G and II up to the line N, fig. 7. Iodide of silver collodion is affected from below G nearly to the line M; bromide of silver collodion from F to M. A mixture of silver salts formed Of the iodide and bromide of collodion is sensitive to the action of the spectrum in the space from the line E to the line M. Mixed iodide and chloride of silver collodion are acted on throughout nearly the same area. The remarkable increase of sensitive area when the spectrum falls on the above named mixtures has long been turned to good account in practical photography. (See Photography.) The most remarkable confirmation of Draper's first proposition, as given above, is in the case of the spectral action on a surface of West India bitumen. A glass plate is coated with this substance as follows: The bitumen is dissolved in benzine, and the solution poured on a glass plate in a dark room and drained off, leaving a film of bitumen sufficiently thin to be iridescent. This is exposed to the spectrum for five minutes, and then developed by pouring over it a mixture of benzine and alcohol, which will now only dissolve those portions of the film that have not been acted on by the light. The beginning of the impression is below the line A, its termination beyond H. Every ray in the spectrum acts. The proof is continuous except where the Fraunhofer lines fall. Dr. Draper found that the decomposition of carbonic acid gas by plants is accomplished by rays between the lines B and F, which is another instance of the chemical action of the less refrangible rays. In 1842 Sir John Herschel discovered that the yellow stain imparted by the corchorus Japonica to paper is whitened by the green, blue, indigo, and violet rays. The rose red of the ten weeks stock is in like manner changed by the yellow, orange, and red. The rich blue tint of the viola odorata, turned green by sodium carbonate, is bleached by the same group of rays, that is, by those less refrangible than the yellow. The green chlorophyl of the elder leaf is changed by the extreme red. To a former experimenter, Grotthus, we owe the discovery of the law under which these decompositions of the colors of flowers take place. This law in repeated instances was verified by Herschel, and more recently by Draper. It may be thus expressed: The rays which are effective in the destruction of any given vegetable color are those which by their union produce a tint complementary to the color destroyed. Even the partial establishment of this law, already accomplished, is sufficient to prove that chemical effects are not limited to the more, refrangible portions of the spectrum, but can be occasioned by any ray. The second proposition of Draper, that the rays which act chemically on a substance are those which are optically absorbed by it, has received ample independent confirmation by the recent experiments of Sellak in his paper cited above. Sellak found that optical and chemical absorption of light exactly coincide. All colors which are sensibly absorbed (optically) by the haloid salts of silver, of a thickness of a few millimetres, produce chemical decomposition. The optical absorption of transparent plates of these substances is shown by spectral observation to be confined exactly within the limits of chemical action. This is especially the case with mixtures of iodide and bromide of silver. Chloride of silver is colorless, iodide of silver is transparent light yellow, bromide of silver is somewhat deeper yellow, and the mixture of the last two orange yellow. - E. Becquerel in 1842 (Bibliotheque Uni-verselle de Geneve) was the first to photo-| graph the Fraunhofer lines, and in doing so he discovered that similar lines existed in the invisible portion of the spectrum, formed of rays more refrangible than the violet. In 1843 Dr. Draper obtained independently the same results. Muller, in the sixth edition of his Lehrbuch der Physik, gives a photographic print of the spectral lines extending from a short distance below G to above R. He made this photograph with a prism and lens of quartz. Subsequently Mr. Rutherfurd obtained, with two prisms of carbon disulphide, a superb photograph embracing lines extending from near b to a considerable distance above the upper of the H lines. This photograph has excited universal admiration. It is crowded with lines which are not drawn on the maps of Kirchhoff or of Angstrom. Mas-cart of Paris obtained the Bordin prize of the academy of sciences for his determinations of tbe wave lengths of the visible and ultra violet rays of the spectrum. He used a grating of Nobert to obtain his spectra, and measured the wave lengths of the more refrangible invisible rays by obtaining photographs on small glass plates placed in the ocular E of the spectrometer shown in fig. 4. By this means Mascart measured the wave lengths of these invisible rays with a precision little inferior to that obtained in his measures on the visible rays. He also measured the wave lengths of the light lines given in the spectra of volatilized metals, and found that cadmium gave the most extended spectrum of invisible rays. Mascart observed rays whose wave length was only .00022 of a millimetre. The period of vibration of these shortest waves, compared with the period of the longest visible rays of .00076 of a millimetre, gives about two octaves of the musical scale; that is, the numbers of their vibrations in the same time will be as 1 : 4. But the ratio of the wave length '0010 of a millimetre of the least refrangible invisible ray of the spectrum to the shortest invisible ultraviolet wave of the spectrum will be as 1 : 8, or as any note is to its upper third octave. The papers of Mascart can be found in the Annales de l'Ecole normals. 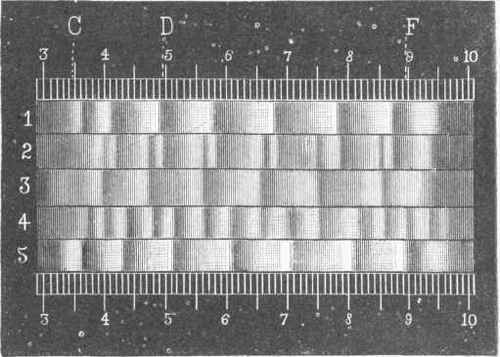 In 1873 Dr. Henry Draper of New York published in the "American Journal of Science" a carbon print of a remarkably perfect photograph of a spectrum produced by one of Rutherfurd's diffraction gratings of 6,481 lines to the inch. The negative was photographed on collodion, and the published carbon print has attached to it a scale giving the wave lengths of the rays. This print was obtained by transferring the original negative to a thick plate of glass by a process known as the albertype, and using the glass in a printing press in the same manner as a lithographic stone. Fig. 6. 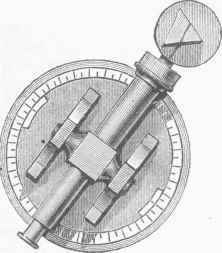 - Rutherford's Ruling Engine. Fluorescence is a property possessed by certain substances of absorbing light composed of rays of a certain wave length, and then emitting this light changed into rays of a longer wave length; or, what is the same, changed into light of a lower refrangibility. This phenomenon was first observed by Robert Boyle; an account of his experiments may be found in vol. i. of his works (London, 1772). The method of examining the spectra of fluorescent bodies is as follows: A porte-lumiere, A, fig.9,. 9, reflects the sun's rays on to a lens at B, which concentrates the light on the fluorescent substances contained in bottles at C. By the revolution of the stand on which these bottles are placed, they can bo brought successively before the slit in the collimating telescope of the spectroscope D. Before the solar rays fall on the fluorescent substance they pass through a tank, placed between B and the spectroscope, and containing a solution of cupric sulphate in ammonia. The general phenomena of fluorescence are described under Fluorescence; we here add several discoveries made since the writing of that article by Prof. Morton of Ho-boken. In a portion of his researches Prof. Morton had the cooperation of Dr. H. C. Bolton of New York, who undertook the chemical work in the investigations. Their attention was particularly directed to the fluorescent properties of the uranium salts. The total number of distinct salts produced and examined so far by these investigators is 75, not including numerous specimens treated in various ways to establish the existence and conditions of their several hydrates. This multiplication of facts has given great value to this research as compared with previous work in the same direction. Thus, where Becquerel has examined one double acetate, these investigators have examined 16; in place of his three double sulphates, they have 16; in place of one fluoride, six; and so on. The methods pursued in the examination of these uranium salts were the same as those of Stokes and Becquerel. The discoveries made by Morton were mainly due to the wider range of substances examined, which made it possible to form inductions and generalizations, and to the scrupulous attention paid to the purity of these substances. We note only the most important results, and refer the reader to the following original papers for additional information : "American Chemist," vols. iii. and iv. ; "Chemical News," vol. xxviii. 1. By a comparison of the spectra of 17 acetates and double acetates of uranium in the solid state and in aqueous solutions, the remarkable fact was demonstrated that in the case of these bodies no double salt could exist in solution in water. By further experiments of the same kind this law was extended to all the known salts of uranium. 2. It was proved that by the study of the fluorescent spectra the existence of a new and before unknown salt could be recognized. Thus, on heating the ammonio-uranic sulphate to 100° C. for a short time, it was noticed that its fluorescent spectrum assumed a. duplicate character (see spectrum 2 of fig. 10), a new set of bands being added to those of the normal salt (see spectrum 1 of fig. 10). By continuing the heating until the salt ceased to lose weight, a substance was obtained giving spectrum No. 3 of fig. 10. These results naturally suggested that the two spectra 1 and 3 belonged to the hydrated and anhydrous salts, and that spectrum 2 indicated a mixture of the two. On heating the dried salt to low redness for a short time, another double spectrum, No. 4, was developed, which by a continuance of the same treatment was reduced to a new simple one, No. 5. Analysis of the product so obtained showed that it was an ammonio-diuranic sulphate, a salt before unknown and not likely to have been discovered by any other means, as contact with water at once reduces it to a mixture of the normal salt and uranic sulphate. 3. It was discovered that certain uranic salts were capable of combining with definite proportions of water to form certain hydrates not heretofore recognized, and that each of these hydrates yielded a perfectly distinct and characteristic spectrum. Thus, the double sulphate of sodium and uranium seems to form no less than five hydrates with from one to five atoms of water respectively. These salts have not all been isolated, hut fig. 11 shows the spectra of some of them. Thus No. 1 of the figure is the spectrum of the pentahydrate; No. 2, that of a mixture of three hydrates; No. 3, that of the monohy-drate; and No. 4, that of the anhydrous salt. 4. In the case of the double acetates it appears that the position of their bands both of fluorescence and of absorption has a close relation to the atomic weights of the salts. Thus, a list of these salts in the order in which their bands occur, beginning with those which are highest in the spectrum, will be essentially a list of the salts in the order of their atomic weights. 5. It was found that heat had invariably the effect of sending toward the red end of the spectrum all spectral bands of solids and of solutions in all cases where any effect could be observed. In a later memoir Prof. Morton, having investigated the fluorescent relations of the basic salts of uranic oxide, has shown many now ways by which these bodies may be produced, and has found that they yield by fluorescence a light which gives a continuous spectrum. The latter property affords a ready means of distinguishing them, when either alone or in mixture, from hydrates and uranates, which they otherwise often resemble. The same methods of investigation have been applied by Prof. Morton to the following solid hydrocarbons found in the latter products of the destructive distillation of coal tar: anthracene, chrysogen, pyrene, and chrysene. He has also discovered a new hydrocarbon of very remarkable fluorescent properties occurring in the products of the destructive distillation of the heavier potroleum oils; to this he has given the name of thallene, from the vivid green color of its fluorescent light. When a continuous spectrum is thrown on a screen of white paper," half of which is coated with thallene, the effect indicated in fig. 12 is seen. The portion R V, on the paper, shows the usual solar spectrum from red to violet, but the part S T, on the thallene, does not appear, from 8 of the scale upward, blue, indigo, and violet, but appears green of varying intensity. The energy of the fluorescent action of this body makes it available for some very striking illustrations. Thus designs painted in it on muslin may be invisible in yellow light, but flash out with a self-luminous light when violet light falls upon them. When a pure spectrum is thrown on the side of a tank containing a solution of thallene in benzole, the appearance indicated in fig. 13 is seen. The trails of light are of the following colors: olive green, bright emerald green, sky blue, and indigo running into violet. The value of the applications of spectrum analysis to fluorescent phenomena, as developed by Prof. Morton, consists in its opening a new method for investigating chemical and physical changes in bodies while these changes are in progress, and under conditions which would seem to exclude all other means of examination. SPECTRIN ANALYSIS, the name given to a recent method of chemical analysis, conceived and proposed in general form by Prof. G. Kirchhoff of Germany, in which the presence of certain chemical elements is determined by corresponding and peculiar sets of colored bands, imparted by those elements or compounds containing them to the spec-tra obtained from flames in which such substances are sublimed or volatilized. In reference to the solar spectrum and the transverse dark bands or lines of Fraunhofer marking it. see Spectrum; see also Sun. In 1802 Wollaston prepared the way for the discoveries of Fraunhofer, Kirchhoff, and others, by the invention of a new method of observing the solar spectrum. He admitted the solar rays into a dark room through a narrow slit, and placing himself at a distance of 12 ft. or more he viewed this slit through a prism of homogeneous glass held close to the eye. This method of observation shows the spectrum crossed transversely to its length by dark lines and bands; and hence the spectrum from a prism of given material and angle becomes a sort of scale or map, to a fixed position in which every gradation of hue and every dark band can be exactly referred. Among the observations upon the spectrum, partially anticipating Kirchhoff's principle, were those of Fraunhofer (1815), of Talbot (1826), of Brewster (1832), of Wheat-stone (1835), and of Foucault (1849). In 1855 Prof. A. J. Angstrom of Sweden, applying Euler's principle of the reciprocation and absorption by bodies of the same sorts of undulations which they are capable of emitting when themselves originally excited, was led to the view that any body at a glowing heat emits the same rays (refrangibilities) of light and heat as, in the like condition, it will absorb if they impinge upon it. The first decisive and general proof in reference to light of the principle assumed by Euler and Angstrom was furnished by Kirchhoff's experiments in 1859, with flames charged with lithium and sodium. A volatil-izable compound of any such element being burned in or otherwise diffused through a flame, the incandescent particles of each communicate to the general light of the flame an excess of certain rays, these appearing in the spectrum as brighter bands crossing it in certain parts and having the exact colors proper to such parts, being generally different in situation and hue for the different elements introduced into the flame, and always or generally the same for each element. Fig. 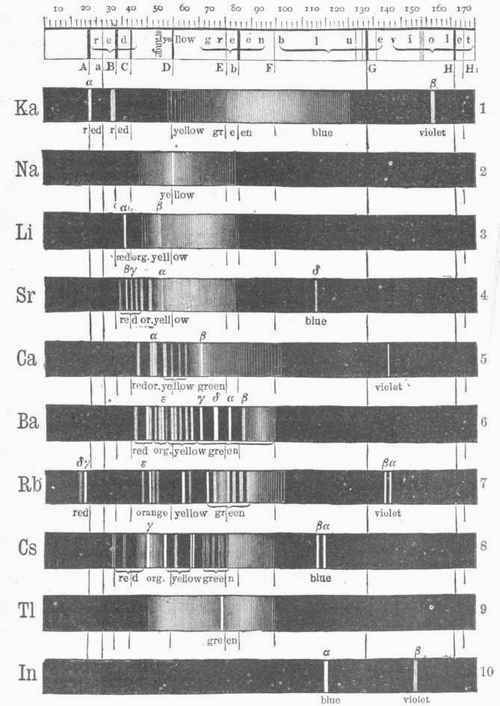 1 shows the spectra of various chemical elements, the symbols of which are given on the left of the spectra. The upper spectrum is that of the sun, and on it are drawn the dark lines of Fraunhofer. (See Spectrum.) These lines are extended downward and through the lower spectra, and they thus serve as a kind of scale to which to refer the luminous bands of these spectra. The colored spectral bands are designated by the letters of the Greek alphabet, and are named in order of their importance as characteristic of their respective spectra. When, however, a flame is thus colored, or charged with excess of certain rays, if through this the light of another and more brilliant flame colored with the same element is passed to be analyzed, it is seen that while the general illumination of the spectrum is increased, the previous bright lines characterizing the element are now replaced by dark lines or lines relatively very faint; in a word, the spectrum characteristic of the given element is exactly reversed. The lower dark portion of fig. 2 shows the two bright lines of the spectrum of incandescent sodium vapor; the upper portion of the figure shows these lines reversed by the passage of the light from an incandescent solid through the vapor of sodium. (For an engraving and description of the spectroscope, the instrument with which spectrum analysis is effected, see Spectrum.) In the prosecution of the new field of research opened by these experiments, Prof. R. Bunsen soon became associated. When several elements which show systems of bright bands are at the same time in the flame, it is at least generally true that their several spectra coexist; and the instances in which certain lines proper to different elements coincide are as yet few. The spectrum of sodium consists of two approximate bands in the yellow of the spectrum near the orange, and seven relatively very faint lines; and Bunsen has determined that by it the presence in a flame of less than the 1/180.000,000 Part of a grain is detected. Of calcium, barium, strontium, potassium, and lithium, the least quantities detectible vary from 1/60,000 to 1/100,000. grain; so that no other chemical test approaches this in delicacy. Among results of the new analysis are, the finding that lithium is in fact an element widely diffused in nature, and the discovery of sevoral new metals. (See CAesium, Indium, Rubidium, and Thallium.) - This method of analysis has proved of great service in metallurgical operations. The application of the method to researches in solar physics will be briefly noticed under Sun. 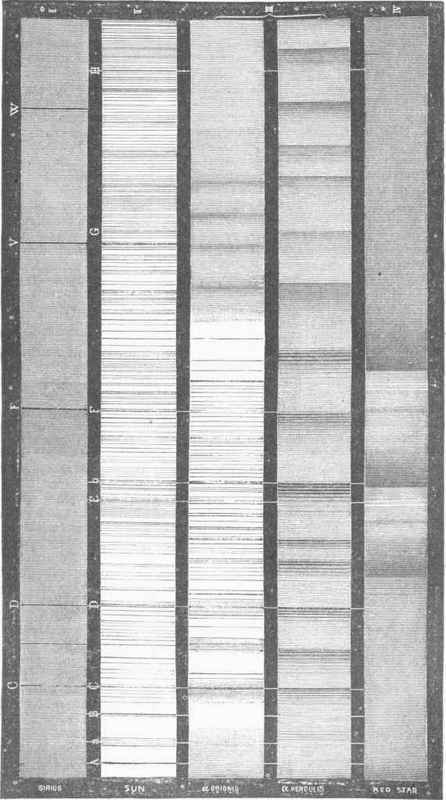 Kirchhoff, having satisfied himself that the bright lines characteristic of several of the metals correspond exactly in place with as many dark lines of the solar spectrum, as shown in fig. 3, infers that these dark lines are produced by a reversal similar to that above shown, and hence indicate the existence of corresponding chemical elements, both volatile in the luminous atmosphere of the sun, and also incandescent in its nucleus. Fig. 1. - Table of Spectra according to Kirchhcff and Bunsen. Fig. 2. - Reversal of the Sodium Line (seen with the Spectroscope). Fig. 3. - Coincidence of the Fraunhofer Lines with the Lines of Iron and Calcium. Spectroscopic analysis applied to the stars has shown that they resemble the sun in general constitution and condition. But characteristic differences exist, insomuch that the stars have been divided into four orders distinguished by their spectra, types of which are given in fig. 4. These are thus presented by Secchi, who examined more than 500 star spectra : The first type is represented by a Lyrae, Sirius, etc, and includes most of the stars shining with a white light, as Altair, Regulus, Rigel, the stars β, γ,ε, ζ, , and n of Ursa Major, etc. These give a spectrum showing all the seven colors, and crossed usually by many lines, but always by the four lines of hydrogen, very dark and strong. The breadth of these four lines indicates a very deep, absorptive stratum at a high temperature and at great pressure. Nearly half the stars observed by Secchi showed this spectrum. The second type includes most of the yellow stars, as Ca-pella, Pollux, Arc-turus, Aldebaran, a Ursaa Majoris, Pro-cyon, etc. The Fraunhofer lines are well seen in the red and blue, but not so well in the yellow. The resemblance of this spectrum to the sun suggests that stars of this type resemble the sun closely in physical constitution and condition. About one third of the stars observed by Secchi showed this spectrum. The third type includes Antares, a Orionis and a Hercu-lis, β Pegasi, Mira, and most of the stars shining with a red light. The spectra show bands of lines; according to Secchi there are shaded bands, but a more powerful spectroscope shows multitudes of fine lines. The spectra resemble somewhat the spectrum of a sun spot, and Secchi has advanced the theory that these stars are covered in great part by spots like those of the sun. About 100 of the observed stars belong to this type. The fourth type differs from the preceding in the arrangement and appearance of the bands. It includes only faint stars. A few stars, as γ Cassiopeia?, η Argus, β Lyrae, etc, show the lines of hydrogen bright instead of dark, as though surrounded by hydrogen glowing with a heat more intense than that of the central orb itself around which the hydrogen exists. Secchi's observations were comparatively rough, and the inference that particular lines, as those of hydrogen for example, are really present depended in his case simply on the general correspondence of a set of lines with the set belonging to the element. But Huggins and Miller, in England, showed, by the direct comparison of stellar with terrestrial spectra, that certain elements exist in particular stars. Thus they found in the spectrum of Aldebaran lines corresponding with those of hydrogen, sodium, magnesium, iron, tellurium, calcium, bismuth, antimony, and mercury. In the spectrum of Be-telgeuse they recognized the lines of sodium, magnesium, iron, bismuth, and calcium, but found those of hydrogen wanting. They discovered that (at least in the instances examined by them) the colors of the double stars are due to the existence of stellar atmospheres exercising an elective absorption. For example, the spectrum of the orange component of the well known double star Albirco shows dark bands in the blue and violet; while the spectrum of the blue component shows many strong lines in the orange and red. - The nebulae show two orders of spectra. One class, including the clusters, resolvable and suspected resolvable nebuhe, besides other nebula) which probably are resolvable into stars though no signs of the fact can be detected with the telescope, show a spectrum resembling the stellar spectrum in general characteristics, though usually too faint to be assigned to any given order of stellar spectra. The other class, which includes all the irregular and planetary nebulae, besides most of the elliptic irresolvable nebulae, the ring nebula in Lyra, the dumb-bell nebula, and others, presents the remarkable phenomenon of a spectrum of three bright lines (in a few cases four lines are seen). Fig. 5 is the spectrum of the nebula known as II 4,374. This is a small but bright object, and it is the nebula to which Huggins in 1864 first directed his telespectroscope. One line agrees in position with a hydrogen line, another with a nitrogen line, but the third line has not yet been shown to coincide with a line of any known element. - Comets show a mixed spectrum, the nucleus, coma, and tail each giving a combination (though in varying proportions) of a discontinuous or band spectrum, and a continuous spectrum due probably to reflected sunlight. 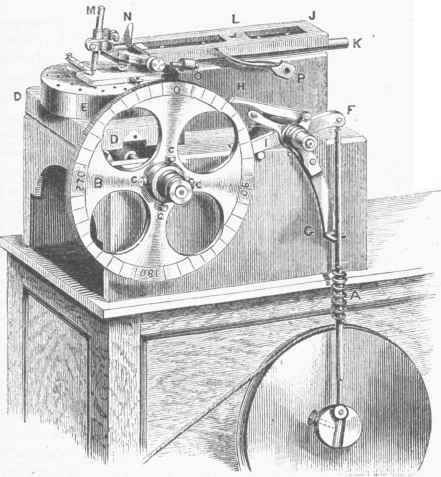 Tempel's comet (1866) was the first analyzed with the spectroscope, by Huggins in England. Winnecke's (1868) was the first to which careful analysis was applied, with the curious result of observing that the bands agree in position with those obtained as the spectrum of carbon, by passing the electric spark through olefiant gas. Huggins obtained the same result (which was confirmed by Professors Harkness and Young in America) from the study of Encke's comet in 1872. The first large and long-tailed comet studied with the spectroscope was Coggia's comet of 1874. 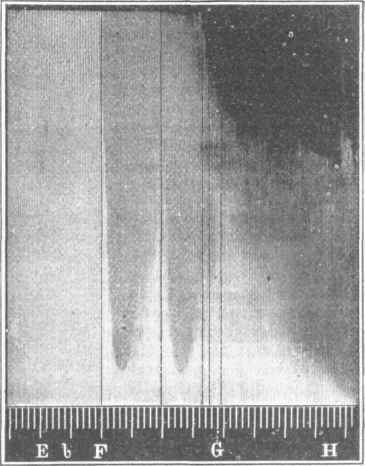 Huggins gives the following account of the spectroscopic analysis of this comet: "When the slit of the spectroscope was placed across the nucleus and coma, there was seen in the instrument a broad spectrum, consisting of the same three bright bands exhibited by comet II., 1868, crossed by a linear continuous spectrum from the light of the nucleus. On the continuous spectrum of the nucleus I was not able to distinguish with certainty any dark lines of absorption, or any bright lines, other than the three bright bands. Besides these spectra, there was also present a faint broad continuous spectrum between and beyond the bright bands. When the slit was moved on to different parts of the coma, the bright bands and the faint continuous spectrum were found to vary in relative intensity. When the slit was brought past the nucleus on to the commencement of the tail, the gaseous spectrum became rapidly fainter, until, at a short distance from the nucleus, the continuous spectrum predominated so strongly that the middle band only, which is the brightest, could be detected on it." - The planets, shining by reflected light, can only reveal under the spectroscope the possible presence of absorptive vapors in their atmosphere. (See Mars). Fig. 4. - Secchi's Types of the Fixed Stars. Fig. 5. - Spectrum of Nebula (II 4,374).